Why? Well, this form of camping (which could also be described as ‘glamping’) allows visitors to see the best of the off-the-grid, wild, and remote locations of Banff National Park without sacrificing luxury. Each A-frame tent is a canvas unit with raised cot beds, heater and thermarest. Perhaps the best part of all though – an on-site cook for the whole stay, preparing hearty cowboy cuisine before sitting around the crackling fire under the stars. Along with the history, routes, stories and culture, our cowboy and cowgirl guides know backcountry hospitality better than anyone. While befriending the noble steed which you ride on to your campsites, you’ll get the opportunity to question your guides about the area, and of course the food they’ll be cooking up. 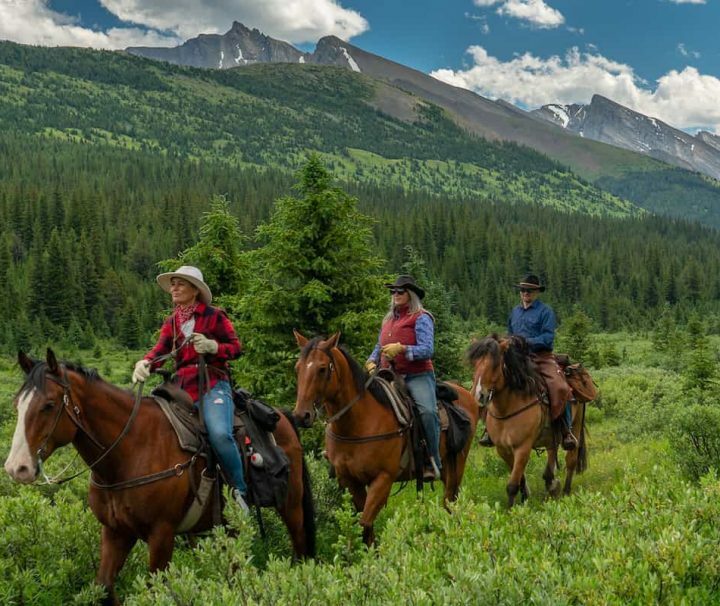 We offer two different horseback riding tent pack trips to suit guests, both offering the luxury of being in the backcountry away from other campers, sounds, and cell service. Both of our trips start at Mount Norquay after meeting and parking at Warner Stables and taking the Banff Trail Riders shuttle up the mountain. The main difference between both though, is how long guests are wanting to explore the backcountry. Our 3 Day, 2 Night horseback riding vacation is the perfect taste of the far unknown. On Day 1, you’ll venture towards Elk Lake Summit where you’ll have lunch with just the guides, horses, and you. Already, you’ll be at a spot that very few tourists venture out to. This is truly disconnecting and rediscovering pioneer past – without the burden of roughing it. Night one is spent at Stoney Creek Camp which is a location that holds strong First Nations significance. Here you’ll be treated to night one of this rustic, yet well-equipped experience. Day 2 is an adventure tailored to you – Stoney Creek Camp is the jumping off point for many rides in this area, as this was mainly used by Banff Park Wardens for patrolling the Park boundaries. Length and scenery are to the decision of you and your guide – surprises like wildlife? That’s nature’s choice. Day 3 could see you riding back to Banff, or for those on our longer Banff horseback riding pack trip this day brings us to an area that is new and unique to Banff National Park – Flints Camp has wide-open terrain that is the location for the Bison Free Range Zone, an area of the park where bison have been reintroduced to the park and are now roaming for the first time in over 140 years. The wide-open area also makes it a good one for spotting wildlife, and is one of the original outpost areas used by wardens to patrol the park in the early days. Eat up, sit around the fire, and enjoy your heated tent under the stars. Day 4 allows us the opportunity to explore the area around Flints Campsite. Whether you’re a hiker, photographer, or fisher, this area has a lot to offer. The area around this post has some of the most pristine wilderness our backcountry has to offer and it’s all yours with none or rarely another person in sight. Day 5 is your custom day. Like the three-day trip, your guide will create a custom VIP experience tailored to your backcountry desires and take you on as much or little adventuring you’d like. The trip is yours, relax, hike, or ride as much or as little as you’d like. The end of our trip is Day 6 and it is, unfortunately, the day when you must part from your steed who you’ll have grown a strong bond with by now, your guides who will feel like family, and the backcountry which has been your home-away-from-home. Our last day is a 17-mile ride from Flint’s Park Camp to the Minnewanka Pack Station with a lunch stop at the meeting point of Stoney Creek and Cascade River. Reflecting on the past six days, you’ll ride to the Lake Minnewanka area where your shuttle will take you back to Warner Stables for around 5:30pm to 6pm. 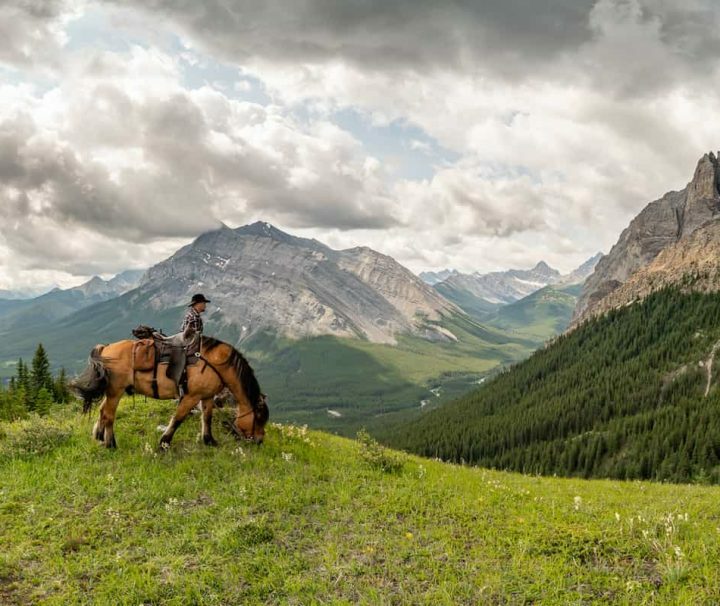 Banff Trail Riders’ horseback riding trips are the best way to camp in the backcountry of Banff National Park – each trip is uniquely remote, adventurous, and scenic. Camping in the backcountry, without the burden of camping. Our heated tents, on-site cooks, and friendly guides will provide you with a memorable experience that will make any trip to Banff National Park unforgettable.